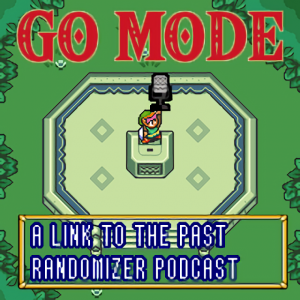 Go Mode (or GoMode) indicates the point during a race at which the player has obtained all items required to collect 7 crystals and defeat Ganon. The actual items required to achieve Go Mode are different for every seed. For instance, the Flippers may not be a Go Mode item if neither Swamp Palace nor Ice Palace contain crystals, but Flippers would be required for Go Mode if either one of those locations contains a crystal. “Schrodinger’s Go Mode” -Also sometimes referred to as “Conditional Go Mode”, a state where it is not clear if the game may be completed with the current item set. Most notable example is going into Ganon’s Tower bootless- the big key may or may not be placed on a torch requiring boots to retrieve it. Also applies to Turtle Rock and Misery Mire Medallion requirements. – Thanks to H. Herbert-Lovern for this additional info.